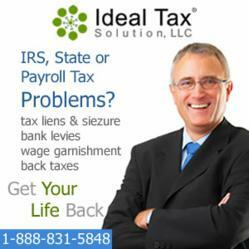 Ideal Tax Solution Expands Their Legal Department and Offering Great Job Opportunities for Enrolled Agents, Experienced in Back Taxes, Tax Liens & Wage Garnishment. Ideal Tax Solution has doubled its accounting and customer service departmental workforce in the past year and now looking to increase its legal department by hiring more enrolled agents (EA) to service the growth of new clients that have tax problems. Ideal Tax Solution announces career opportunity for Enrolled Agents looking to join a company with growth potential. An “Enrolled Agent” (EA) is a tax professional recognized by the U.S. Federal Government to represent taxpayers in dealings with the IRS. To become an Enrolled Agent an applicant must pass the Special Enrollment Application or present evidence of qualifying experience as an Internal Revenue Service employee. A background check, including a review of the applicant’s tax compliance, is conducted. The IRS also requires Enrolled Agents to complete 72 hours of continuing professional education every three years. The down economy with loss of jobs and business slowdowns has generated an influx of new clients who are currently unable to pay past or current taxes. "Ideal Tax Solution provides a service that represents persons who need help in negotiating with the IRS in lowering tax liability, tax penalties, tax liens, wage garnishments, and property seizures". The company employs tax attorneys and enrolled agents who are able to negotiate with the IRS or State Tax Board on behalf of the client, many times with results that a person trying to take on the government alone cannot accomplish. About the company: Ideal Tax Solution, LLC is located in Costa Mesa, CA and provides tax negotiation services, preparation and is a collection defense specialist. Their Tax Attorneys, IRS Enrolled Agents, CPA’s, Senior Tax Consultants have over 55 years of combined experience working to help American tax payers with the IRS and State Tax Agencies. Ideal Tax boasts an "A" rating with the Better Business Bureau earned through providing excellent services. Contact erin(at)idealtaxsolution(dot)com for Job Opportunities.